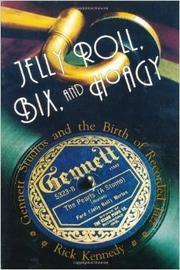  Delightful history of Gennett Records, its parent the Starr Piano Company of Richmond, Indiana, in the 1920s, and the birth of recorded jazz, by a former business and entertainment reporter for the Cincinnati Post and the Richmond Palladium-Item. Among the stars that Gennett was the first, or one of the first, to record were King Oliver and His Creole Jazz Band, Louis Armstrong, Jelly Roll Morton, the New Orleans Rhythm Kings, the Red Onion Jazz Babies, and Bix Beiderbecke. Gennett pressed the first recordings of Hoagy Carmichael's ``Star Dust'' (by Hoagy Carmichael and His Pals) and as an up-tempo stomp! From Thomas Edison's earliest cylinder to the major legal battles between Gennett and giant Victor Records over patents, Kennedy traces the history of the recording process, showing how Gennett's victory made possible the growth of many smaller recording companies. Gennett, which began as a piano company, at one point had sold 300,000 pianos and maintained a huge factory complex in Starr Valley to which jazz artists would come and find themselves sandwiched between salon orchestras, comedy recordings, health fitness records, and recordings of folks such as William Jennings Bryant, who waxed his ``Cross of Gold'' speech for Gennett. Meanwhile, Gennett also recorded for the Ku Klux Klan: ``While the Gennett family employed blacks in their homes, the Starr factories never employed blacks in the 1920s,'' Kennedy says. He discusses the Oliver/Armstrong cornet duets and shoots down the tale that Louis had to stand fifteen feet off not to overpower Joe. He describes the shaping of the Beiderbecke legend and the later mystery of the lost Armstrong and Beiderbecke masters once Gennett Records folded. For jazz followers, not to be missed. A huge success.